Marcion is unanimously acknowledged to be one of the most important and most intriguing figures of the Early Church. In spite of this importance, there is no comprehensive up-to-date study on his life and thought. Thus, the desire to fill this gap within the academic world - which is inconvenient for both students and professors alike - has been the inspiration for writing this thesis. 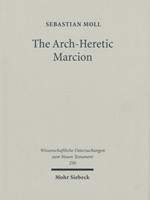 However, this work does not only aim at providing a complete study on Marcion for the twenty-first century, but also at ridding scholarship from several severe misconceptions regarding the arch-heretic. The main argument of Sebastian Moll's study is that previous scholarship has turned Marcion's exegesis of Scripture upside down. He did not find the inspiration for his doctrine in the teachings of the Apostle Paul, it is the Old Testament and its portrait of an inconsistent, vengeful and cruel God which forms the centre of his doctrine. Marcion does not understand the Old Testament in the light of the New, he interprets the New Testament in the light of the Old. This insight casts a new light on Marcion's place within the history of the Church, as the initiator of a fundamental crisis of the Old Testament in the second century. But not only did he have an enormous influence on Christian exegesis, he also stands at the beginning of the epochal fight between orthodoxy and heresy. As the first man to ever officially break with the Church for doctrinal reasons, and whose biography would become a stereotype for future heresiologists, Marcion can rightfully claim the title of 'arch-heretic'.